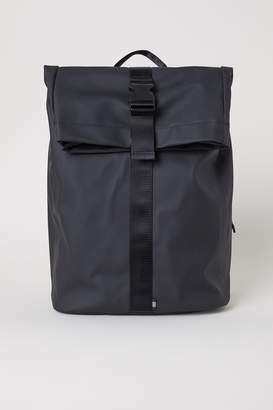 Tubular backpack in rubber with a flap with press-studs at the sides that can be rolled up and fastened with an adjustable tab and plastic fastener at the front. Mesh-covered padded back and lightly padded, adjustable shoulder straps. One small side compartment with a taped zip and one inner compartment with a hook and loop fastening at the top. Lined. Size approx. 15x31x41 cm with flap rolled down, 15x31x63 with flap rolled up.